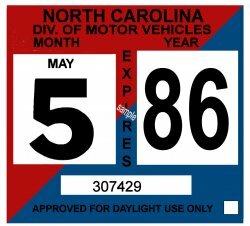 1986 North Carolina INSPECTION Sticker - $20.00 : Bob Hoyts Classic Inspection Stickers, Add a Final Touch to your Restoration! This beautiful 1986 North Carolina sticker was created and restored, both front and back, directly from an original. It has a "Peel and Stick" backing on the FRONT of the sticker allowing you to adhere it to the inside of your windshield. For an additional $10.00 your license plate number can be added to this sticker. 1966-67 North Carolina INSPECTION Sticker.